The cGCMs considered here were the Institut Pierre Simon Laplace (IPSL) and the Model for Interdisciplinary Research on Climate (MIROC) which simulate the mean patterns of climate in diverse ways (Figure 1). These two models were chosen from the Intergovernmental Panel for Climate Change (IPCC) Coupled Model Intercomparison Project Three (CMIP3) data set because they exhibit low differences between simulated and observed boundary conditions. The IPSL model developed in France is described by Hourdin45 and Krinner46, and has a dynamic global vegetation scheme with biosphere feedback via surface energy exchanges. Its horizontal resolution is ~2.5°, consistent with the NCEP data sets. The MIROC model from Japan47 utilises a higher resolution similar to the CFS-R and GPCP data sets. The MIROC boundary layer and surface flux schemes are shared with the Geophysical Fluid Dynamics model. The A1B emission scenario was used,48,49 which assumes a linear increase to a doubled CO2 by 2100. A1B is considered a 'middle of the road' scenario among the Special Report Emission Scenario choices. In hindcast, the A1B simulation is close to the 20th-century replication (20C3M) experiment, and has the advantage of forward projection data. Climatic trends were analysed from various data sets in the 20th century, and from the cGCM simulations in the 21st century. A useful review of data sets is given in Bromwich50. Trends were calculated in the Climate Explorer website (http://climexp.knmi.nl/) by first averaging the monthly data into annual blocks. To determine the spatial pattern, a temporal linear regression was calculated per grid point and maps were contoured according to the slope. For winds and currents, the trends of scalar components were combined into vectors. Trends were highlighted at three points - (1) the southern tip of Africa, (2) the South African maize belt, and (3) the Zambezi River valley - by fitting first- or second-order regression lines to anomaly time series. 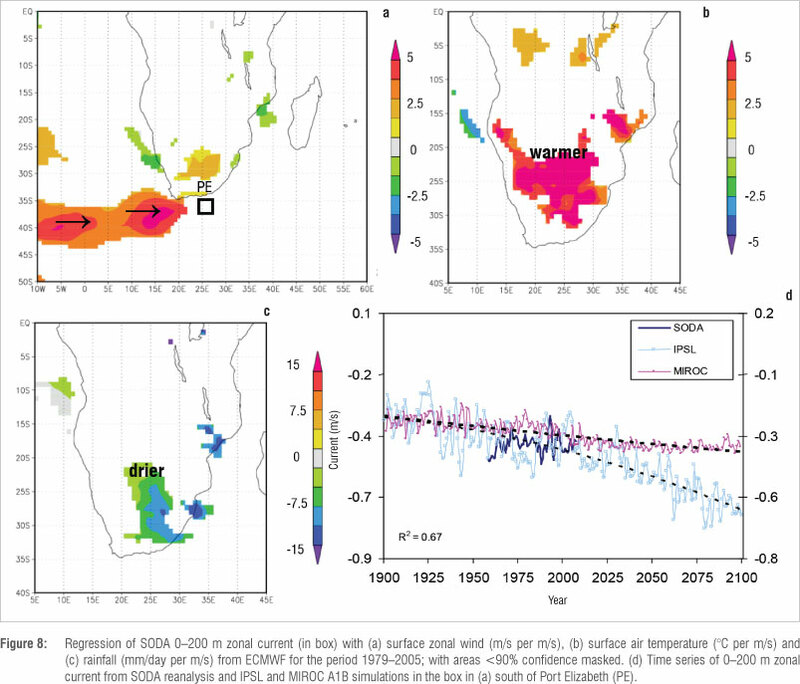 Trends were intercompared for all data sets over the southern Africa plateau (20-30°S, 20-30°E) in the satellite era. In addition to atmospheric variables, analyses were performed of trends in sea surface height and the Agulhas Current using SODA and MIROC fields and coastal station data. The observed trends 'evolved' because of multi-decadal fluctuations, rising greenhouse gases and changes in observations such as more satellites and fewer stations.51 The analysis of climate trends is complicated by small signal-to-noise ratios for variables such as rainfall,32 parameterised convection in reanalysis, inadequate cGCM simulation of surface feedback and aerosol forcing, and differing time periods. 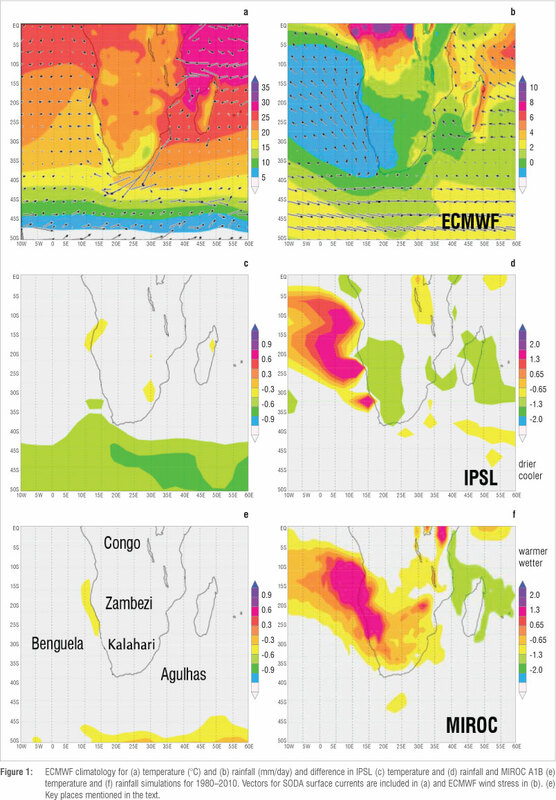 The results presented here are divided into (1) a 30-year climatology, (2) patterns of trend for temperature, rainfall and SLP (3) temporal trends at key points, (4) historical trends in atmospheric circulation, (5) sea level trend maps and trend maps at key points, and (6) trends in the Agulhas Current south of Africa. The 30-year climatology for surface air temperature and rainfall provided by the ECMWF (interim) reanalysis is in Figure 1. This reanalysis was used as a reference and to compare with model simulations as a result of its consistent data assimilation and incorporation of both observations and remotely sensed information. The tropical-temperate gradient, effects of cool (west) and warm (east) ocean currents and highlands was evident in the temperature field. The IPSL simulation had a cool bias (-0.4 °C) across the ocean south of Africa, indicative of weak penetration by the Agulhas Current. Over terrestrial southern Africa there was no temperature bias in either simulation. The MIROC climatology had a slight warm bias in the northern Benguela and across the ocean southeast of Africa (+0.4°C). The ECMWF rainfall climatology exhibited a dry zone across the Benguela and Kalahari (15-35°S, 10°W-25°E). Heavier tropical rainfall was located over the Congo Basin and in the west Indian Ocean. Both IPSL and MIROC simulations exhibited a wet bias over the northern Benguela, which, for MIROC, extended inland across the Kalahari, whereas the IPSL rainfall simulation had a weak dry bias (-0.6 mm/day) over the Kalahari with respect to ECMWF. Both models adequately reflected the pattern of air temperature over southern African, despite differences in resolution and parameterisation schemes. Surface air temperature trends were positive among the data sets (Figure 2) and larger in recent periods. The NCEPe and NCDC warming trends were +0.01 °C/year over the 20th century (similar to HADCRU) and tended to be greatest over the lowlands and marine environment. Both ECMWF and CFS-R data sets exhibited faster warming in the sub-tropical Indian Ocean, southern Congo and coastal plains (+0.03 °C/year) in the second half of the 20th century, and weaker trends in the South Atlantic mid-latitudes. The IPSL and MIROC model A1B simulations in the period 1900-2100 exhibited faster warming over the southern plateau and Kalahari, with an extension south of Cape Town. The shortest data set (CFS-R) indicated rapid warming in the Agulhas outflow region, likely caused by changes in regional currents29,52 and upstream warming in the West Indian Ocean.31 Unlike the model simulations, none of the observed temperature trends were greatest over the interior highlands and plateau. Rainfall trends were mixed (Figure 3) and generally negative across marine latitudes (35-40°S) south of Africa, particularly in the ECMWF, GPCP and model data sets. The NCEPe and GPCP trends were downward over the Congo, while ECMWF and CFS-R trends were upward over the Congo. 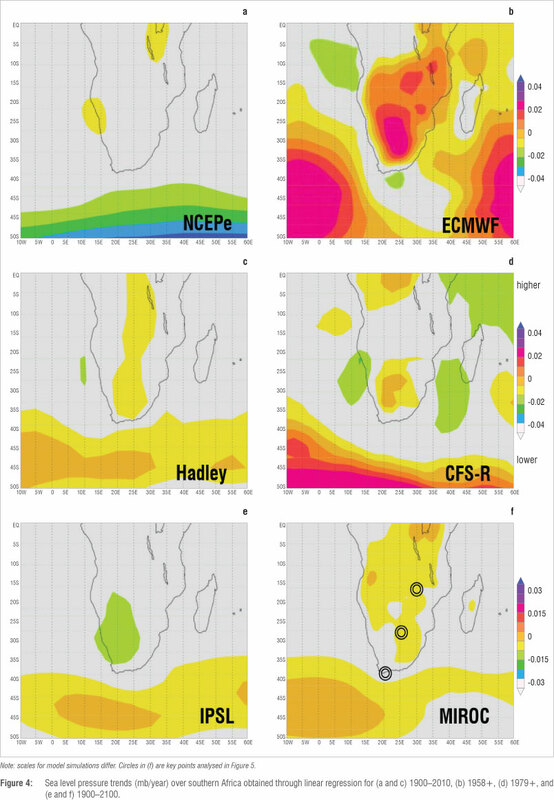 All data sets exhibited upward trends in the equatorial West Indian Ocean, while NCEPe and the model simulations indicated rising rainfall in the mid-latitudes. The ECMWF and CFS-R rain trends were upward over the tropical Atlantic Ocean, a feature also found in IPSL and MIROC A1B simulations. There was a declining trend over Madagascar in the GPCP data set that is supported by the CFS-R data, while ECMWF showed a declining rainfall trend in eastern South Africa. Except for the wet (north) and dry (south) trend pattern, there was limited consensus among the various data sets with regard to rainfall. Trends of SLP in Figure 4 showed rising pressure over southern Africa, particularly in the ECMWF data set and to some extent in others, but not in the IPSL data. Over the adjacent sub-tropics where the marine anticyclones reside, all data sets (except NCEPe) indicated rising pressure. The CFS-R and MIROC data sets suggested an intensification of the South Atlantic anticyclone, while the Hadley observations and IPSL simulation indicated equal strengthening of the South Indian anticyclone. The IPSL SLP trend reflected a trough over southern Africa. Although the signals were somewhat mixed, there was agreement in that the subtropical anticyclones are migrating poleward. 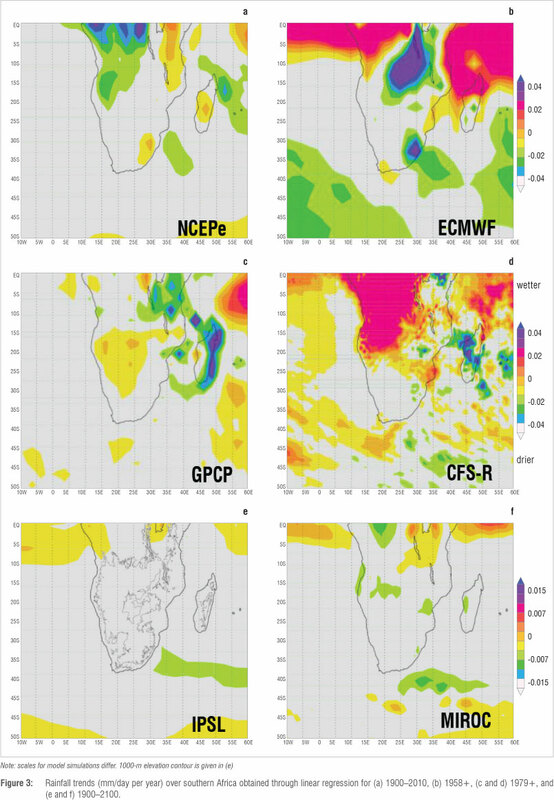 Southern African key area trends for temperature and rainfall anomalies are given in Figure 5 (cf. Figure. 4f) which intercompares observations, reanalysis and cGCM outputs. Model outputs were consistent with observations in terms of trend and variance, with the exception of ECMWF having a flatter trend and greater variance. Rainfall variance increased from south to north, but temperature variance was more uniform (Figure 5g and 5h). The IPSL surface air temperature trend exceeded that of MIROC (Figure 5c). Temperature trends for the period 1900-2100 were second order with a ~90% fit, leading to a +2 °C anomaly by the end of the 21st century. Rainfall trends were linear downward, with fit and trend decreasing from south to north. cGCM projections of rain deficits by the end of the 21st century were -0.3 mm/day (a decrease of 15% in total). Effects on the water budget could be compounded by rising evaporation. Table 1 shows an intercomparison of the trends for temperature and rainfall over the plateau of southern Africa (20-30°S, 20-30°E) in the various data sets over a common period, 1979-2010. This period is rather short for climate change analysis, but may facilitate understanding. Although drought prevailed in the early 1980s, temperatures show upward trends of more than +0.4 °C/year in the MIROC and IPSL model simulations; between +0.02 °C/year and +0.03 °C/year in the NCDC, HADCRU, CFS-R and NCEPe data sets; +0.01 °C/year in the NCEPr and GHCN observations; and ECMWF data showed no change. Temperature increases were most significant (r > +0.6) in the model simulations and NCDC observations. Rainfall trends were minimal during that period, but significantly upward of +0.01 mm/day per year for NCEPr and ECMWF reanalysis, and downward for IPSL. A critical impact of climate change is the rise of sea surface height. Sea surface height was studied using SODA reanalysis, coastal gauges and the MIROC A1B simulation (Figure 7). 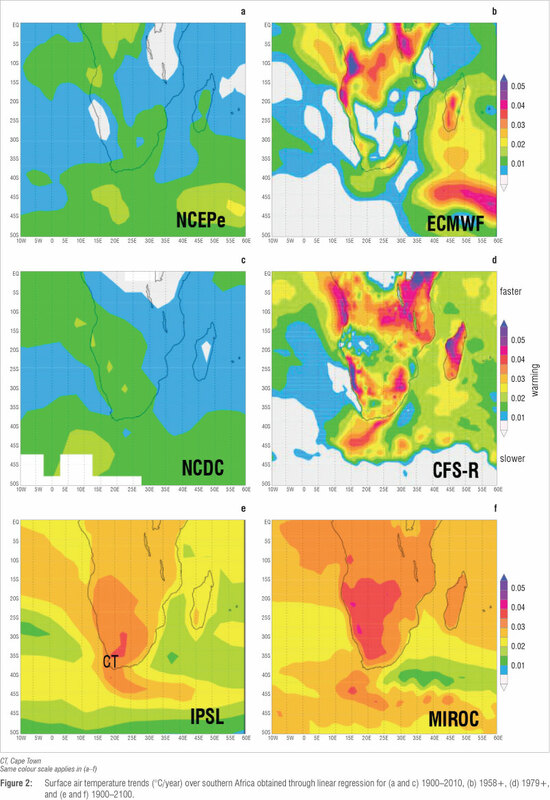 The rate of rise of sea surface height in SODA since 1958 is consistent with the global average of + 1.5 mm/year,55 and is faster along the east coast, probably as a result of warming of the Agulhas Current and associated shifts in the zonal wind belts.56 Upper ocean currents showed a distinct equatorward trend near Africa over 0-20°S, yet trends to the south were minimal. Beal57 found that waters inshore of the Agulhas Current derive from East Africa, hence this source is diminished. In the MIROC simulation, the rate of sea surface rise on the south coast accelerated with time, generating a second-order trend (0.017t2) with a 83% fit. There was also a growth in year-to-year variance that may be associated with increased 'storminess'. To the southeast of Africa, sea surface height rose faster in the 21st century, corresponding with a faster Agulhas Current. While model-simulated trends generally exceeded observed trends (cf. Figure 5c), for sea surface height the historical record for South Africa exceeded the A1B projection (Figure 7c). The linear trend averaged over four stations was +1.5 mm/year with a mean correlation fit of 0.68 over the period 1970-2008. The climate of southern Africa has undergone a significant warming which may accelerate from +0.01 °C/year to +0.02 °C/year.58 While the IPCC Assessment Report Four (AR4) consensus was for rapid warming over the Kalahari plateau, here the results suggest warming will be faster over the coastal plains. Table 1 shows an intercomparison of trends over southern Africa in the satellite era. 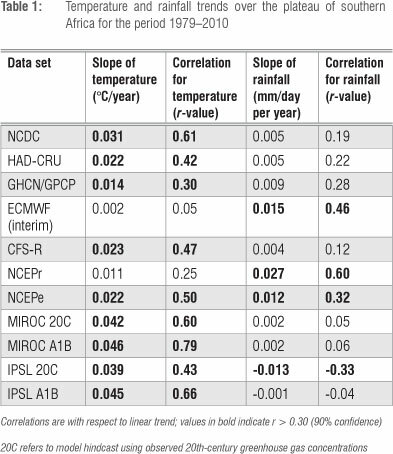 Temperatures exhibited upward trends of more than +0.4 °C/year in the MIROC and IPSL A1B model simulations; between +0.02 °C/year and +0.03 °C/year in NCDC, HADCRU, CFS-R and NCEPe data sets; +0.01 °C/year in NCEPr and GHCN observations; and near zero in the ECMWF data set. Temperature increases were most significant (r > + 0.6) in the model simulations and NCDC observations. The SLP analysis exhibited a poleward shift of the sub-tropical anticyclones (cf. 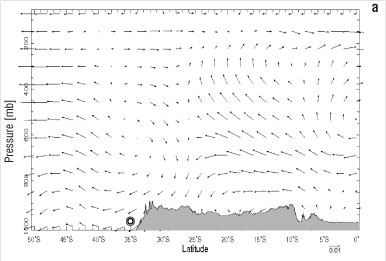 Figure 4) which will affect ocean-atmosphere coupling. This aspect was considered by regression with zonal currents south of Port Elizabeth (Figure 8a-8c), wherein spells of slower Agulhas Current coincide with westerly winds in the 35-45°S band and warmer drier conditions over the adjacent land. 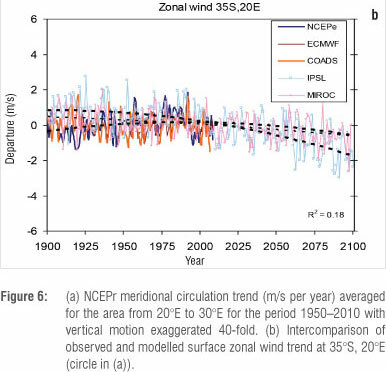 While the SODA currents show little trend in the 20th century (Figure 8d), both IPSL and MIROC models predict an acceleration of the Agulhas Current in the 21st century (U<-0.5 m/s) - a factor which could mitigate some of the regional impacts of climate change. CMIP3 model performance is known to be scale dependent,59 and further work with CMIP5 models would be useful. Considering model simulated and projected rainfall over southern Africa (Figure 5 and Table 1), there was a total decline of -0.6 mm/day and even larger interannual variations. Although rainfall trends were minimal in many data sets during the satellite era because of a drought in the early 1980s, there was a significant downtrend in the IPSL simulation of 0.013 mm/day per year. There will be additional stress on water resources, so adaptation and conservation strategies are needed, such as shifting agriculture to higher ground and improving water use and recycling, as has been suggested in earlier research.60,61 A key finding reported here is that observed trends are consistently below model projections, except for coastal sea level which translates into impacts from beach recession. Nicolas Fauchereau of the Council for Scientific and Industrial Research (South Africa) provided useful comments on the manuscript. Many data analyses were made in the Climate Explorer website (http://climexp.knmi.nl).